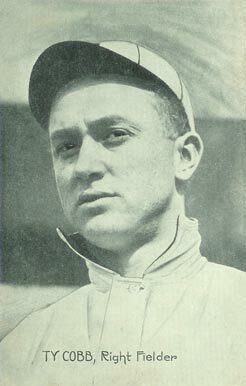 Tyrus "Ty" Cobb, nicknamed "The Georgia Peach," was anything but a Southern gentleman. Known for his rough play and demeanor, both on and off the field, Cobb may not have been well-liked, but he certainly was respected. 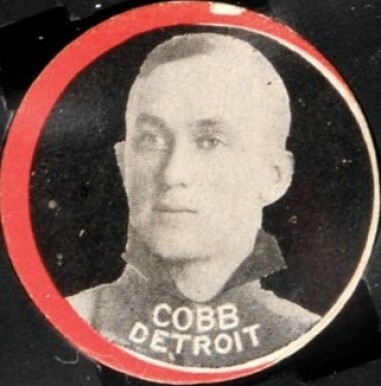 Cobb's 24-year career began in 1905 with the Detroit Tigers, for which he played all but two seasons of his near quarter-century career. A naturally gifted athlete, Cobb could hit for power, average, and steal bases at will. 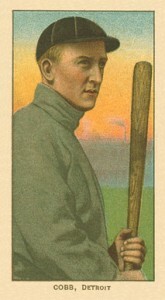 His fielding prowess made him a natural at almost any position, which he played several, but was primarily used as an outfielder. Inducted into the Baseball Hall of Fame's inaugural class of 1936, Cobb's career statistics are nothing short of amazing. His legendary play earned him numerous awards, honors and records. 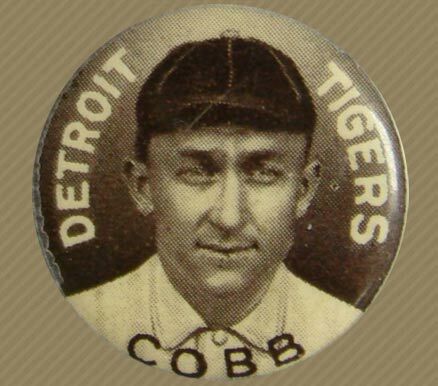 To this day, Cobb remains one of the game's most mythical legends. As such, his trading cards, autographs and game-used memorabilia all command top dollar. With Cobb's origin in the dead-ball era and his career finishing in the live-ball era of Babe Ruth, Cobb was one of the few players to see success in both eras. As a result, Cobb's game-used memorabilia, on the rare occasion it finds its way to the secondary market and/or auction block, sends deep-pocketed collectors and investors into a frenzy. 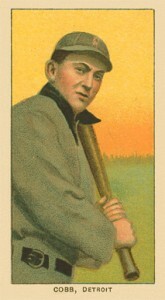 As is the case for all players from the dead-ball era, the Georgia Peach has several tobacco, candy, gum and caramel cards. 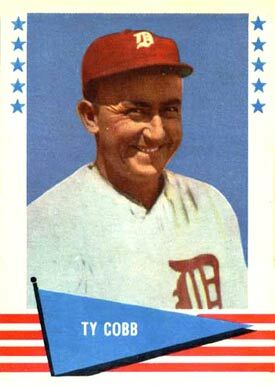 Cobb has multiple cards from the famous T206 set, known in the hobby as "The Monster." However, these weren't his first cards. 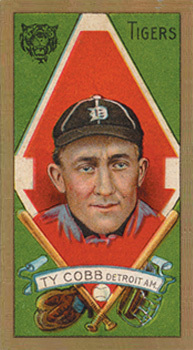 Ty Cobb's first known card can be found in the 1902 Sporting Life Cabinet product. 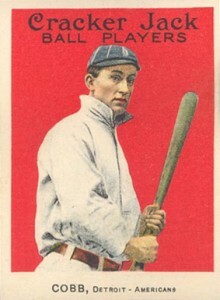 Designated as W600's in the American Card Catalog, his card is #112. Cobb's notoriety made him an easy appeal to companies peddling everything from candy to soap, and trading cards were all part of the package back in this era. 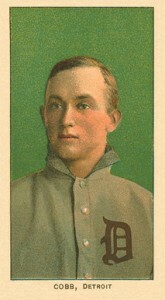 Ty Cobb's first card was part of a 561-card set, produced between 1902 and 1911. 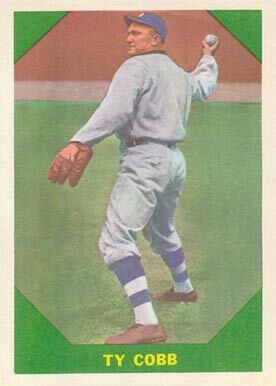 These cards measure 5x7-1/2 inches, making them much larger than other cards of the era. These cards were designed to be displayed standing on a dresser or cabinet, hence their name. Ty Cobb Handwritten Cut Letter Topps Gypsy Queen BAS Beckett Authentic"Olympics"
2010 TOPPS TRIBUTE TY COBB RELICS CARD WITH GAME USED BAT. NUMBER 46 OF 75. 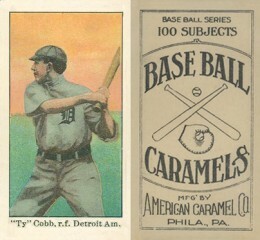 Listed in the American Card Catalog as E90-1, these cards from the American Caramel Company were amongst the first cards to be printed in full color. Measuring a small 1-1/2 by 2-3/4 inches,the entire set consists of 120 total cards. 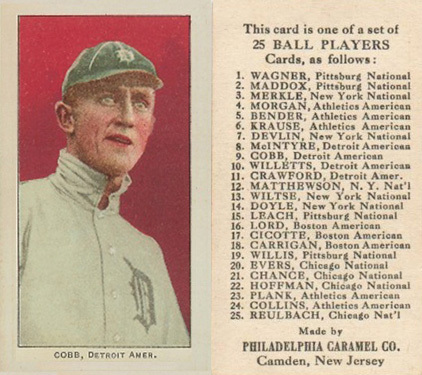 Ty Cobb has four cards within the iconic 1909 White Border set, otherwise known as the T206 set. 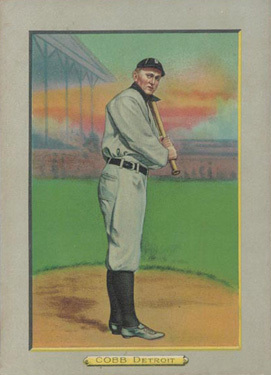 The set is nicknamed "The Monster" due to its scope and size (524 cards), and the number of documented Cobb cards within the set is a major reason why. There are no less than 45 photo and advertising back variations. A master T206 set is not complete without all of them. Each of the cards can be found with different tobacco advertising on the back, including American Beauty, Broad Leaf, Cycle, Carolina Brights, Black Lenox, Brown Lenox, Brown Hindu, Drum, Old Mill, El Principe de Gales, Sweet Caporal, Piedmont, Factory 42, Red Hindu, Polar Bear, UZIT, Sovereign and Tolstoi. 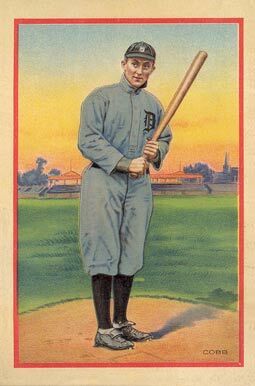 The sequel to the monstrous T206 set was the smaller and more manageable T205. The official name of the set is 1911 Gold Borders and includes 208 total cards, measuring 1-7/16 by 2-5/8 inches. 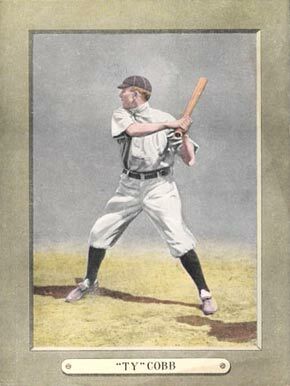 Unlike the nearly four dozen Cobb cards in the 1909 White Border (T206) set, there are only four documented backs: Common, Broadleaf, Drum and Hindu. The American Card Catalog designated them as E145-1. A truly boring moniker for one of the most colorful and beloved trading card sets of the pre-war era. Thankfully, most collectors simply refer to them as the candy confectionery from which they originated, Cracker Jacks. 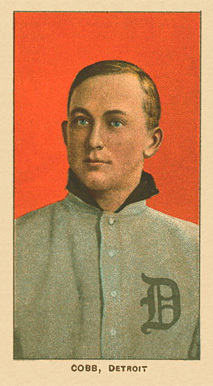 Measuring a unique 2-1/4 by 3 inches, the vibrant red background produced lasting memories for even non-card collectors. 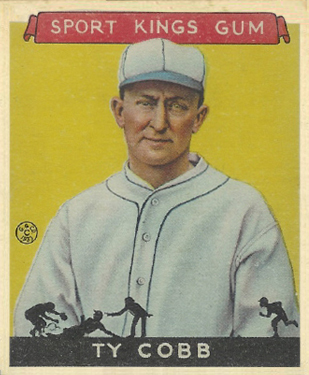 With 144 total cards in the set, Cobb's is one of the most desirable. At the turn of the 21st Century, new innovations in the trading card market gave rise to game-used memorabilia cards and cut signature cards. 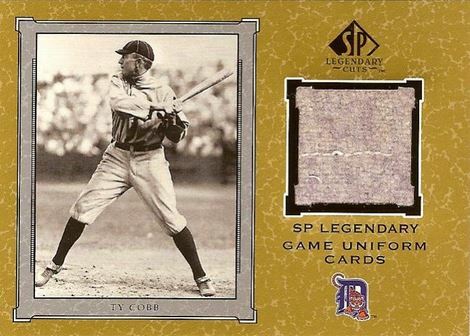 The SP Legendary Cuts brand by Upper Deck became synonymous for showcasing these new creations with retired legends like Ty Cobb. These are some of his first cards using this exciting new technology. 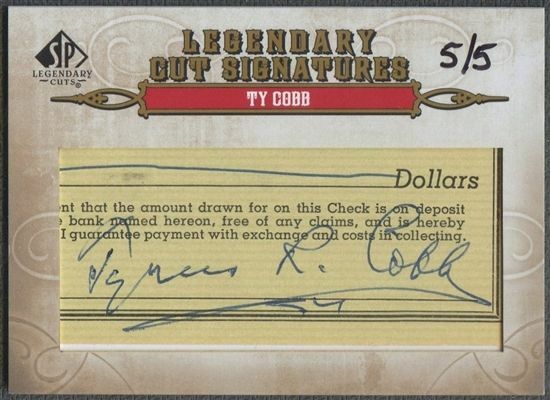 When looking to purchase authentic autographed memorabilia from legendary and long deceased players like Ty Cobb, great caution is urged. 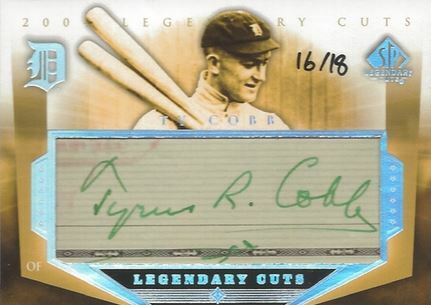 The Cardboard Connection only recommends buying authenticated Ty Cobb signature autographs from one of the reputable authenticators in the industry, PSA or JSA. 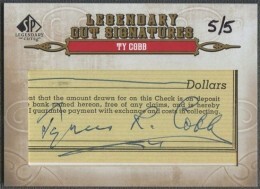 The most common items found to be authentically signed by Ty Cobb include checks and personal documents. Cut signature trading cards from manufactures like Topps, Leaf, Tristar and Upper Deck should also be considered legitimate. have a 2013 a&g silk card of ty cobb. any info on this card? 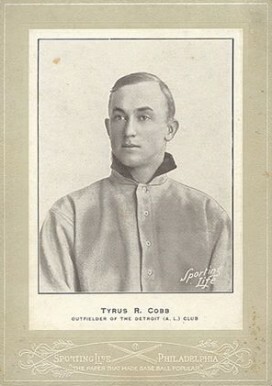 I have a Ty Cobb black and white baseball card. He has a date of 1927 and #425. 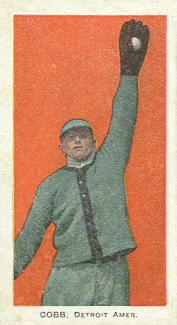 It states it is The Sporting News Conlon Collection. Can someone tell me the value of it? 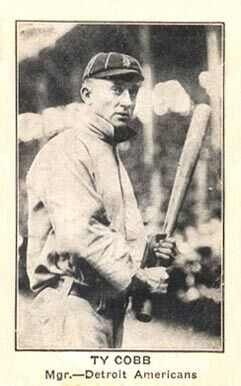 SGC AUTHENTIC TY COBB HOF VINTAGE 1910 W-UNC STRIP CARD HAND CUT "T206 SUBJECT"